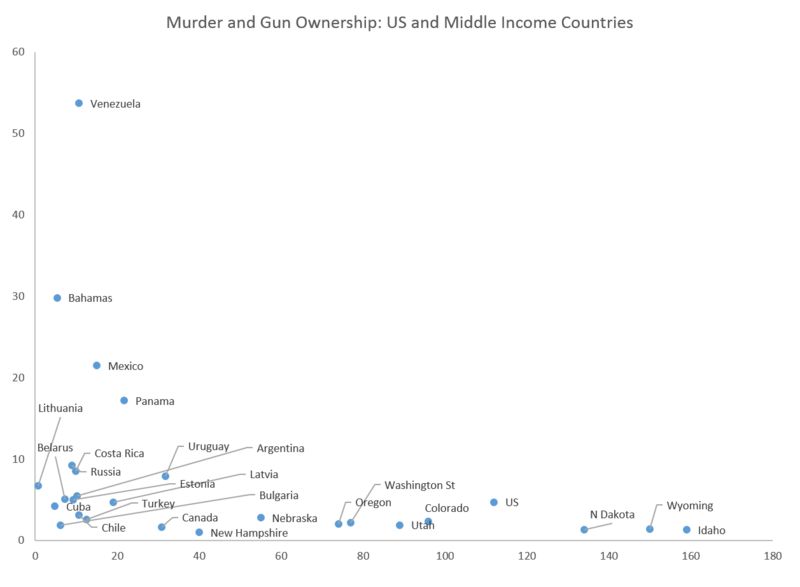 Much of the political thinking about violence in the United States comes from unfavorable comparisons between the United States and a series of cherry-picked countries with lower murder rates and with fewer guns per capita. We’ve all seen it many times. 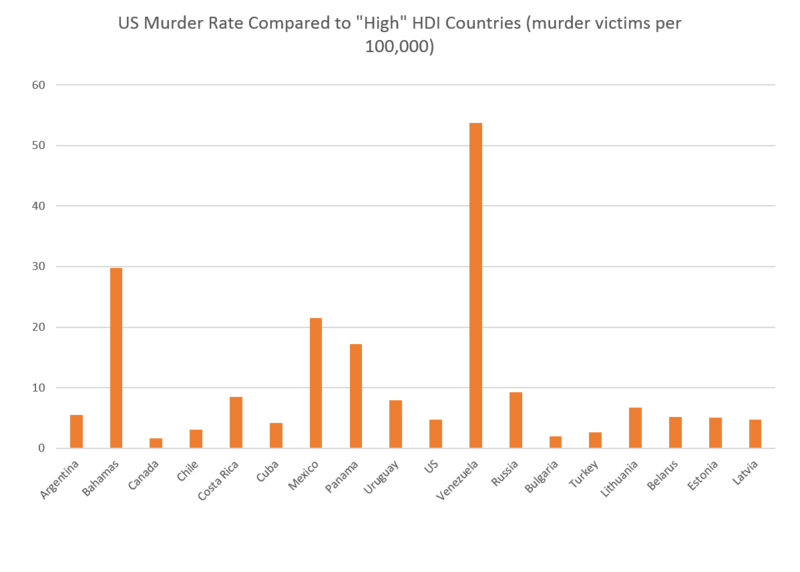 The United States, with a murder rate of approximately 5 per 100,000 is compared to a variety of Western and Central European countries (also sometimes Japan) with murder rates often below 1 per 100,000. This is, in turn, supposed to fill Americans with a sense of shame and illustrate that the United States should be regarded as some sort of pariah nation because of its murder rate. Note, however, that these comparisons always employ a carefully selected list of countries, most of which are very unlike the United States. They are countries that were settled long ago by the dominant ethnic group, they are ethnically non-diverse today, they are frequently very small countries (such as Norway, with a population of 5 million) with very locally based democracies (again, unlike the US with an immense population and far fewer representatives in government per voter). Politically, historically, and demographically, the US has little in common with Europe or Japan. Prejudice about the "Developed World" vs "the Third World"
But these are the only countries the US shall be compared to, we are told, because the US shall only be compared to “developed” countries when analyzing its murder rate and gun ownership. And yet, no reason for this is ever given. What is the criteria for deciding that the United States shall be compared to Luxembourg but not to Mexico, which has far more in common with the US than Luxembourg in terms of size, history, ethnic diversity, and geography? Much of this stems from outdated preconceived and evidence-free notions about the "third world." 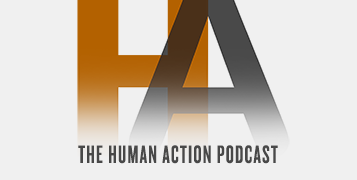 As Hans Rosling has shown, there is this idea of "we" vs. "them." "We" are the special "developed" countries where people are happy healthy, and live long lives. "Them" is the third world where people live in war-torn squalor and lives there are nasty, brutish, and short. In this mode of thinking there is a bright shiny line between the "developed" world and everyone else, who might as well be considered as a different species. In truth, there is no dividing line between the alleged "developed" world and everyone else. There is, in fact, only gradual change that takes place as one looks at Belgium, then the US, then Chile, and Turkey, and China, and Mexico. Most countries, as Rosling illustrates here, are in the middle, and this is freely exhibited by a variety of metrics including the UN's human development index. Once we understand these facts, and do not cling to bizarre xenophobic views about how everyone outside the "developed" world is too dysfunctional and/or subhuman (although few gun control advocates would ever admit to the thought) to bear comparison to the US, we immediately see that the mantra "worst in the developed world" offers an immensely skewed, unrealistic, and even bigoted view of the world and how countries compare to each other. While ignorance about true global poverty, life expectancy, and family planning are no doubt a source of some of these wrong-headed comparisons, one doesn't need to be the world's biggest cynic to recognize that the US is only compared to a selective list of countries because doing so offers a biased view of the United States that makes it looks like an especially crime-ridden place. But, we are never allowed to compare the US to middle income countries like Uruguay, Russia, or Mexico because that would show that the US is actually a remarkably safe place in global terms on top of having many more legally owned guns than those countries. Nevertheless, we've all heard it too many times to count: gun laws in the United States are "insane" because countries like Sweden and Luxembourg have far more restrictive gun laws and are much safer because of it. 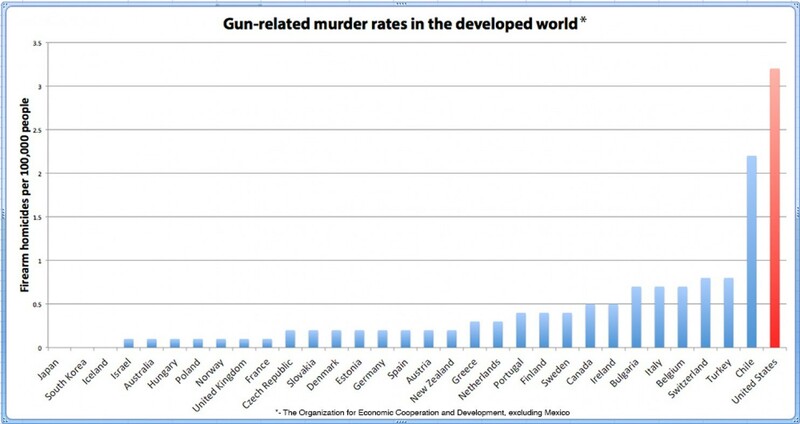 The US has the highest murder rate in the "developed world" — presumably because of its lax guns laws —we are told again and again. Few people who repeat this mantra have any standard in their heads of what exactly is the "developed" world. They just repeat the phrase because they have learned to do so. They never acknowledge that when factors beyond per capita GDP are considered, it makes little sense to claim Sweden should be compared to the US, but not Argentina. Such assertions ignore immense differences in culture, size, politics, history, demographics, or ethnic diversity. Comparisons with mono-ethnic Asian countries like Japan and Korea make even less sense. After mistakenly using the "gun related" killings rate instead of the murder rate (see below) the author, Max Fisher, carefully constructs his comparisons so as to emphasize the gun deaths rate (which is implied to be as good as the murder rate) in the US. As usual, no reason is given as to why the US should only be compared to “developed” countries, but then Fisher proceeds to add a few non-traditional comparisons to drive home the point as to how violent the US truly is, in his view. Why Turkey and Chile and Bulgaria? Well, those countries are OECD members, and many who use the "developed country" moniker often use the OECD members countries as a de facto list of the "true" developed countries. Of course, membership in the OECD is highly political and hardly based on any objective economic or cultural criteria. But if you're familiar with the OECD, you'll immediately notice a problem with the list Fisher uses. Mexico is an OECD country. So why is Mexico not in this graph? Well, it's pretty apparent that Mexico was left off the list because to do so would interfere with the point Fisher is trying to make. After all, Mexico — in spite of much more restrictive gun laws — has a murder rate many times larger than the US. Oh, so every country that has drug war deaths is exempt? Well, then I guess we have to remove the US from the list. At this point, we're reminded that Fisher (and no one else I’ve ever seen) has made a case for what special magic it is that makes the OECD list the one list of countries to which the US shall be compared. So, let’s do that. Here we see that the OECD’s list contains Turkey, Bulgaria, Mexico, and Chile. So, if we're honest with ourselves, that must mean that other countries with similar human development rankings are also suitable for comparisons to the US. Well, Turkey and Mexico have HDI numbers at .75. So, let’s include other countries with HDI numbers either similar or higher. That means we should include The Bahamas, Argentina, Costa Rica, Cuba, Panama, Uruguay, Venezuela, Russia, Lithuania, Belarus, Estonia, and Latvia. Things get even more interesting if we add American states with low murder rates. 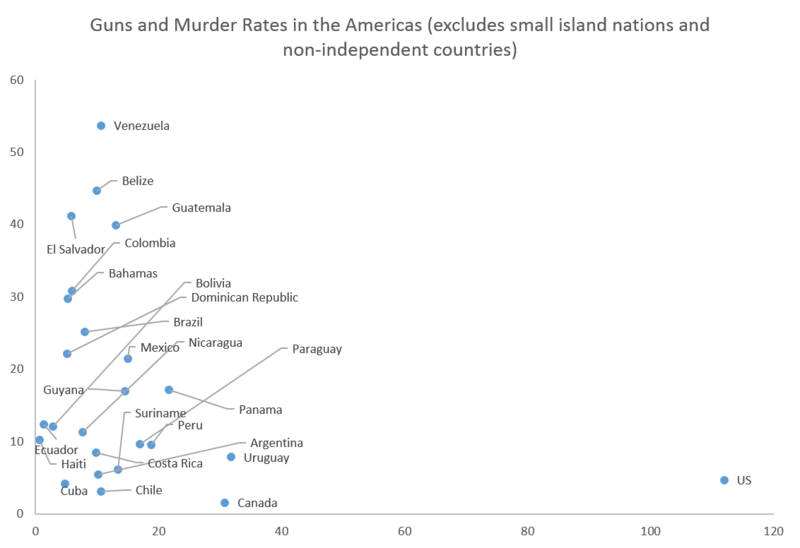 We see that OECD members Chile and Turkey have murder rates higher than Colorado. Perhaps they should try adopting Colorado’s laws and allow sale of handguns and semi-automatic rifles to all non-felon adults. That might help them bring their murder rates down a little. Nevertheless, we have yet to see any objective reason why only OECD countries should be included or why countries similar in the HDI to Turkey and Mexico should be excluded. Obviously, the US is big outlier in terms of guns per capita. 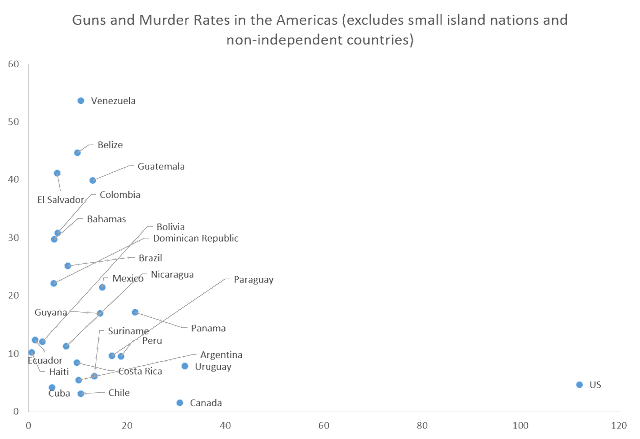 But in terms of murder rate, it’s very much in the middle of these countries. Of course, if I added countries like France and Sweden, you’d see many more dots here near Bulgaria with low gun totals and very low murder rates. By comparison, the US look downright pacific. And why should not this comparison be made? Indeed, it makes more sense to compare the US to other states in the Americas than to Europe or Japan. The US and most Latin American countries were settled in similar time periods. They are frontier countries settled mostly by European immigrants that displaced a native population (to varying degrees), and most of them gained independence from European imperial nations in a similar time period. They tend to have ethnically diverse populations, and many have been impacted by the slave trade that ended in the 19th century. European countries share very few of these qualities in common with the US. 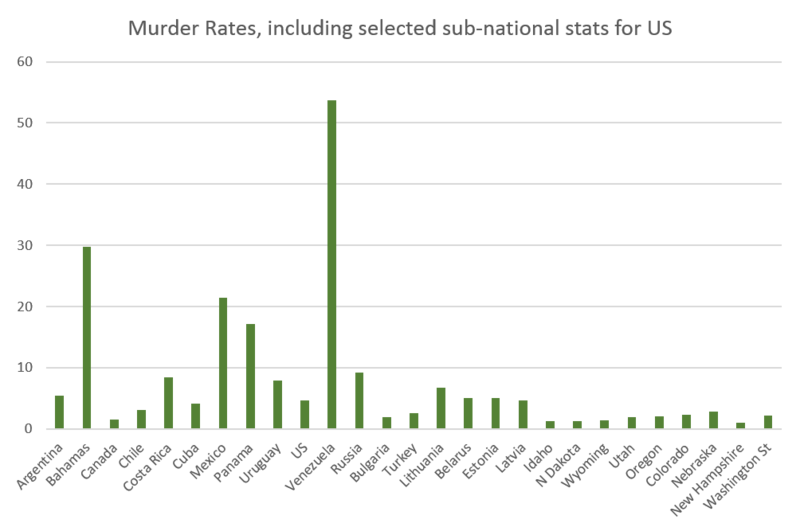 So, it would seem that the old diktat of “thou shalt only compare US murder rates to the approved 'developed' countries" is based on really no objective standard at all. And we should stop doing it. 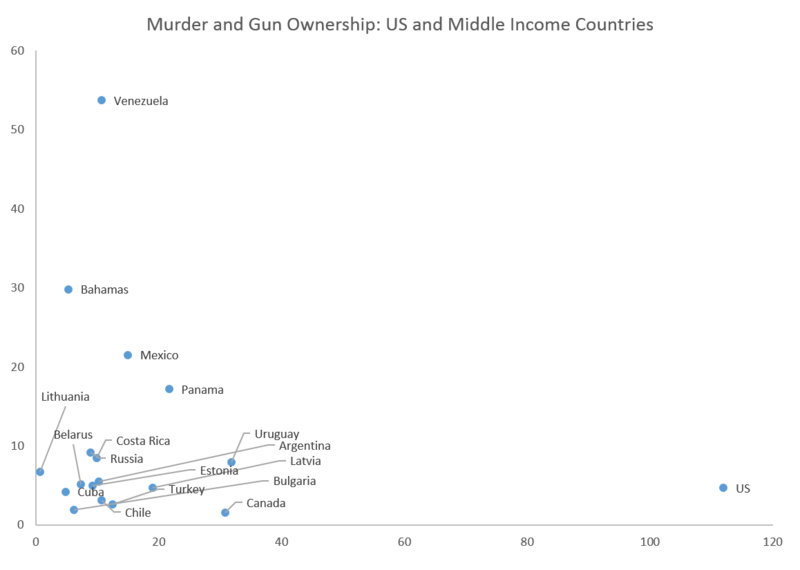 If we’re honestly trying to evaluate the nature of crime and violence in a comparative atmosphere, we cannot limit ourselves to a handful of countries that have very little in common with the US beyond a handful of economic indicators. Gun ownership levels are based on the Small Arms Survey data. This takes into account "registered" vs. "unregistered" civilian gun ownership in the countries surveyed. 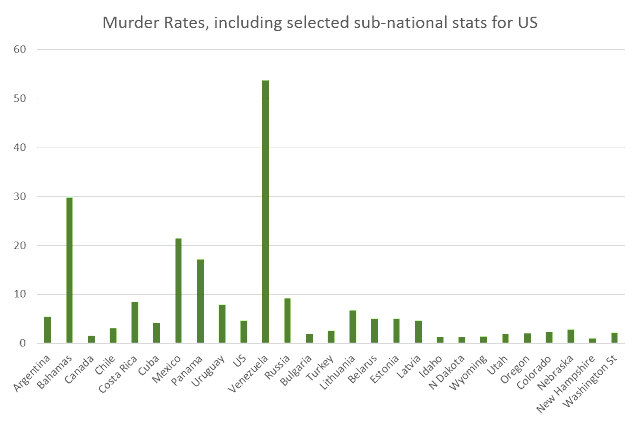 Murder rates come from UNODC data. State by state data in the US is usually presented as a percentage of residents who are gun owners. worldwide, however, gun ownership is presented as numbers of guns per 100 residents. I attempted to make the two lists compatible by taking the percentage of gun owners and adjusting it to reflect the fact that there are about 2.8 guns per gun owner in the US (using Small Arms Survey Data for the US). Thus, in Wyoming, for example, we end up with a number of more than 130 guns per 100 residents. Now, let's address the bait-and-switch of using "gun-related killings" versus homicides, that is often used. These numbers include accidents and suicides. But of course, the reason most people are concerned about gun violence is because of homicides. Many people commit suicides with ropes and cars, but we don't talk about banning ropes and cars. 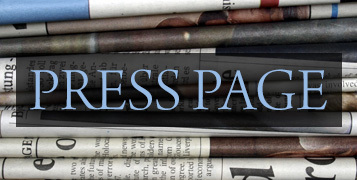 Moreover, many people die from accidents involving power tools, ladders, and other items. Again, we don't talk about banning those things. The other statistic often used is "gun-related deaths." This also ignores the fact that the whole point of gun control (in the minds of most of the public) is to bring down the murder rate. It would be irresponsible to bring down gun murders and then ignore the overall murder rate. After all, if the "gun murder" rate goes down, but the murder rate remains unchanged, then we find that little has been accomplished. It stands to reason that few murdered people think in their last moments "gee, at least I wasn't murdered with a gun."